Want to watch your favorite The Book Of Mormon musical show live? Tickets4Musical is here to provide you cheap The Book Of Mormon tickets. We have huge selection of The Book Of Mormon musical tickets and you can select your seats according to your budget. Tickets4Musical is the best site to get discount The Book Of Mormon tickets and all related info like Schedule, Seating Map, Tour Dates, etc. We have secure payment system and provides you 100% buyers guarantee. We also offer The Book Of Mormon Discount coupon. You can use promo code FIESTA and get 3% discount on your purchase. Hurry Up and Reserve Your The Book Of Mormon Tickets Cheap Now Before it Get Sold. 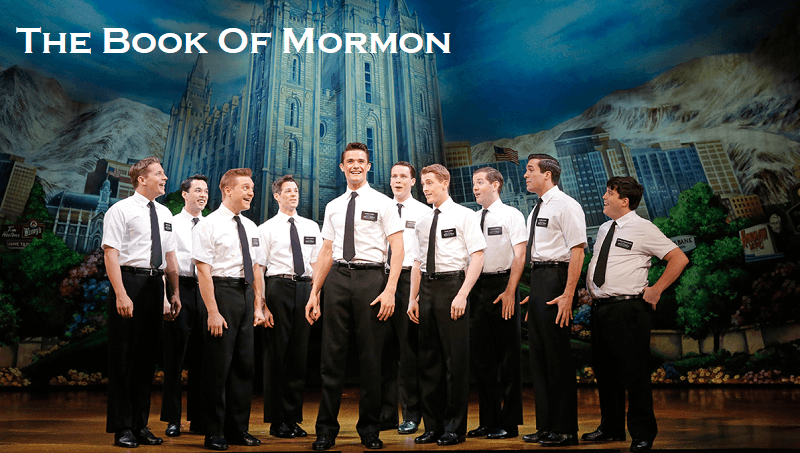 From the creators of South Park comes this hilarious musical, The Book of Mormons, skillfully combining controversial humor with a traditional musical-theatre style since its Broadway debut in 2011. As a religious satire, the story focuses on the misadventures of a mismatched pair of missionaries, Elder Price and Elder Cunningham, as they travel to Uganda to fulfill their obligations to the church where their beliefs and friendships are challenged. Trey Parker and Matt Stone give the musical a thought-provoking undertone, along with enthusiastic songs and witty dialogues which make this satirical show unexpectedly endearing. The Book of Mormon’s well-deserved success makes it a must-see! Be sure to grab your tickets now before the opportunity passes you by.